I bring up this committee and its laudable aims not because I care much about the issue of grade inflation, but because I’m interested in what a proposal to combat grade inflation reveals about the way Dartmouth views the value of education. A close reading of the 2015 AHCPG report reveals an unsurprising focus: diligent, rigorous coursework. This author claims that focus isn’t as well grounded in research as one would think. Now, let’s be clear — I love class. An hour or two with a truly engaging professor, not too early in the morning, and provided some coffee, is absolutely part of a college day well spent. Also the Committee’s reasoning given the data is quite excellent. However, in interrogating the method of grading, the Committee fails to give sufficient consideration to the purpose of grading, and by extension, the purpose of college. Unfortunately, that is not an easy purpose to divine. In economics, there are two ways to view college: The first is that one goes to college to get an education — education being a loosely defined, yet monotonic good. The second is that one goes to college to signal value to future employers — which is both quite depressing and well supported (the 2001 Nobel Prize in Economics was given to three economists who essentially established this idea). But, the idea is still fairly simple. If we ignore, for a moment, the possibility that college is simply a fancy plume in a complex mating ritual with the labor market, then people go to college because they get something out of it. No matter what you might hear, that “something” is not well defined. However, the AHCGPG report seems to think it is. The report concludes with these words: “Too many Dartmouth students have too many activities outside of their classes ... Students need to refocus and understand that they are at Dartmouth to get an education. They have access to world-class faculty, and they need to make the most of their coursework. Extracurricular activities should be just that extra — what they do in their spare time and not their primary focus.” Dartmouth students are indeed here to get an education, but we should not make the mistake of conflating classroom performance with educational return. There is every reason — or at least as much reason — to believe that extracurricular activities, from socializing, to mountaineering, to activism, to artistic performance, to even — God forbid — writing for a newspaper, constitute a substantial, if not majority, share of the educational returns from college. If there is one document that has guided my college experience, it has been sociologist Andrew Abbott’s 2002 University of Chicago “Aims of Education” speech. In it, he argues, “No one has ever taken a thousand bright, ambitious young people like yourselves and sent them not to college but instead to some other, equally challenging, intellectual environment that did not involve classroom instruction, courses, curricula, and so on.” There simply isn’t enough evidence to make the causal claim that classwork is indeed why we go to college. Now, it’s often said that while the details of coursework fade, the general cognitive skills remain. Abbott disagrees: “There is no consistent evidence for a substantial net effect (say a 20 percent or more positive effect) of college instruction on oral communication skills, written communication skills, general reflective judgment, or intellectual flexibility, although there is moderate evidence for some kind of minor effect in all these areas.” Yet, college is a formative four years. We are volatile hormone sacs whose experiences here will be deeply ingrained into our psyche. As such, the things we do extra curriculum might very well be some of the few things we retain. I will submit that the hard sciences and other fields for which post-college pursuits require vast amounts of technical domain knowledge may see a larger share of their educational return in coursework, but still not all. I also do not mean to suggest that the purpose of college lies entirely in its effects on one’s worldly life post-grad. The value system I have cultivated at Dartmouth, the mistakes I’ve made and the way this place has guided my natural maturation will be lessons greater in gravity and longevity than nearly any of those in Silsby or Sudikoff. And yet, the grading strategies suggested by AHCGPG reflect this narrow view of education. They cite a compelling study out of the University of California, San Diego demonstrating that students actually put in fewer hours per week when they expect a higher grade and vice-versa. The study’s specification is airtight, but it measures the relationship between expected grades and hours worked — not the relationship between grading standards and educational impact. Referencing said study implies that a student who spends more hours on coursework is a better educated student. My favorite saying in economics is that “revealed preference does not lie.” In countless surprising ways, the choices human beings make, while seemingly flawed, tend to be based on fairly accurate valuations of each choice. So, if intelligent, motivated college students are spending so many hours, of their own volition, on extracurriculars rather than coursework, it is because they are optimizing their education. So really, I don’t have a qualm with tackling grade inflation. The AHCGPG is almost certainly right that it’s highly unlikely that over half of all grades for a year should be A- or above. But it’s certainly wrong if it thinks that doing A quality work is the sole goal of college — or even the greatest source of a college education’s worth. Grades are only valuable in what they can do to point students toward a richer educational experience. 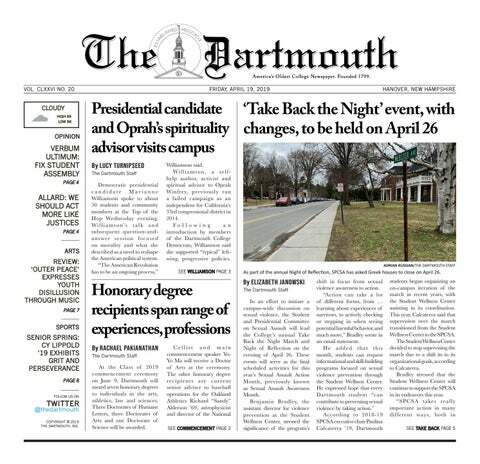 Dartmouth does a disservice to its students if it sacrifices the richness of life here in the name of academic rigor. There’s simply too much to learn.